Forget-Me-Nots Quester chapter was organized February 27, 1973 after four of our chapter members visited a chapter in Iowa. Our chapter name was suggested by Fran Holcomb to honor the flowers by that name that were long-time favorites in gardens of the past. The name also fits with the Quester emphasis on preserving the past for future generations and learning about historical places, people, and things. With eighteen regular members and one associate member, our roster includes antique dealers, men and couples. Recent programs have included Terri Lee dolls, stenographs, wind-up toys, Chinese brush pots, and graniteware. Upcoming programs include Bible quilts, flue covers, Hungarian porcelain, Tibet and history of the American flag. We have enjoyed field trips to the windmill factory in Nebraska City and to the Bess Streeter Aldrich house in Elmwood, Nebraska. Our next outing will be to the International Quilt Study Center in Lincoln, Nebraska to see “War and Pieced,” an exhibition of quilts made by soldiers during war time. Some of the main goals of Questers are restoration and preservation, so our chapter is very happy to have facilitated the floor restoration project at the Bess Streeter Aldrich house in Elmwood, Nebraska. In May, 2018 our Forget-Me-Nots chapter received a grant from the International Questers Headquarters. This grant plus money from our chapter will facilitate removal of not original, very dated carpet on the first floor of “The Elms” and restore the floors to their original state. The project will be completed in January/February, 2019. 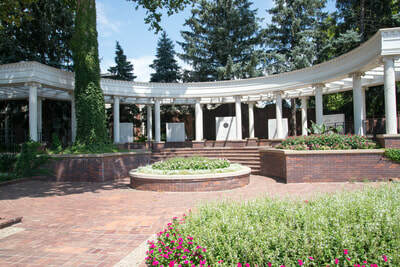 “The Elms” is open to visitors. For information on hours, call (402) 867-4833. As Questers, we have collected many things. We realize, however, that wonderful friends are the best collection of all. If you have an interest in history, preservation, or antiques, our membership is open. Information about joining is available on our “Contact Us” page. Just click on the email address there and leave an email message including your contact information and any questions you might have. One of our State officers will contact you as soon as possible. A flue is a duct, pipe, or opening in a chimney used to conduct exhaust to the outside. One spring ritual of Victorians was to hang a decorative flue cover over the unsightly and drafty hole left when the stovepipe was removed during warm weather. The standard flue cover was 6-8”in diameter, round or oval glass featuring a colorful, pleasant image, such as a woman or child or a botanical print. They were framed in brass or tin with a metal chain and cardboard backing. They were often given away as store advertisements. Buster Brown was a comic strip character created by Robert F. Outcault in 1902, and was adopted by the Buster Brown Shoe Company as their mascot in 1904. Buster, his sweetheart Mary Jane, and his dog, Tyge were well known by the public in the early 20th Century. Buster Brown did not advertise just shoes. Two companies in St. Louis used his image on their spice cans. He can be found on post cards, advertising cards, buttons, toy clickers, sewing kits and clothing. Buster Brown suits made just like his were sold and many children of that era sported Buster Brown haircuts. ​Graniteware​ describes enameled metal coffee pots, colanders, salt and pepper shakers, cake molds, muffin pans, and skillets produced throughout the midwestern and eastern United States from the 1870s until the end of WWII. Patented in 1848 by New York inventor Charles Stumer, graniteware was also known as agateware, enameledware and speckledware. Among the manufacturers were St. Louis Stamping Company and Lalance and Grosjean Manufacturing Company. 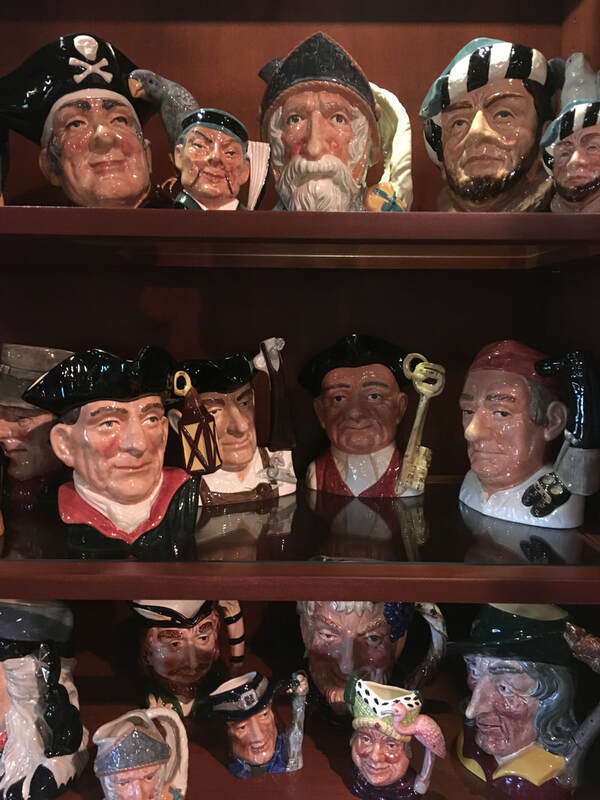 Graniteware comes in blue, white, green, brown, gray, and multi-colored. ​Wind-up toys have fascinated collectors for many years. Those shown in these pictures are a very small sampling of the thousands owned by their collector, who has wind-up toys from at least seven countries. 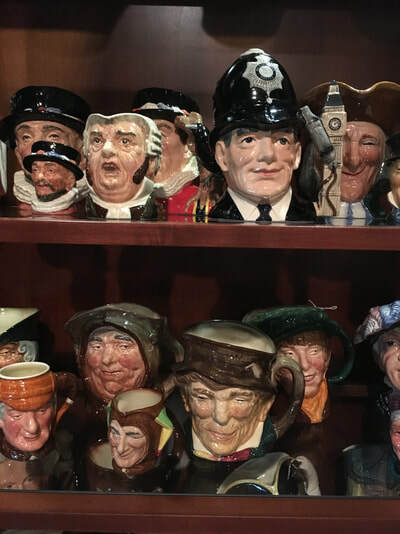 Character or Toby Jugs were made by the Royal Dalton Company in England. Toby Jugs are usually a complete figure. Character Jugs have just the head and shoulders of the person the jugs represent. Character Jugs usually represent theatrical productions, literature, famous people, and politicians. The brushes used in Chinese writing had to be stored with their bristles up so they dried properly. The brush pots were carved from bamboo stems, some very elaborately. The carvings tell a story and were used to inspire artists and scholars to be more creative. The most important room in a Chinese home was the first room or the entry way. It was here that the brushes and other items indicating a person’s culture and position in society were kept. ​We are saddened by the death of our President, Karyl Newman. It was a tragic loss but we are very fortunate that our Vice President, Lee Harlan, has graciously stepped up. On April 5, 2019, our chapter will celebrate 46 years since the approval of our charter in 1973. Evylyn Breunsbach, the first president, and Jenny Pfeifer remain the only two of 24 original members. In September, Lue Puhrman gave an informative program on an 1886 Bible quilt done by African-American Harriet Powers. October saw us heading to David City for a field trip. Later that month, Jim Rosowski presented a program on antique flue covers with Ev Breunsbach showing many that hang in her home. In November, we had Show-‘n’-Tell revealing new additions to our collections and held a silent auction to raise funds for preservation and restoration. December brought our annual Christmas party and Secret Santa gift exchange. Later in December, our chapter visited the home of Nicholas Newman to view his fabulous collection of over 1800 Christmas ornaments, most of which date from the 1920’s and 1930’s while nearly 600 go back to the Victorian period. 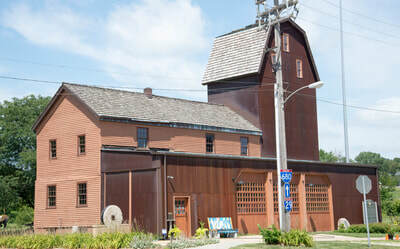 The first picture in the top row of the header is of the Florence Mill. During the winter of 1846-47, while waiting for better weather for their trip west, about 2,500 members of the Church of Jesus Christ of Latter Day Saints (the Mormons) established Winter Quarters in what is now north Omaha under the supervision of Brigham Young. Over 800 cabins and the Florence Mill to grind grain were built to meet the settlers' needs. When the original mill was torn down, some of the good timbers from that mill were used in the new mill and are still there. 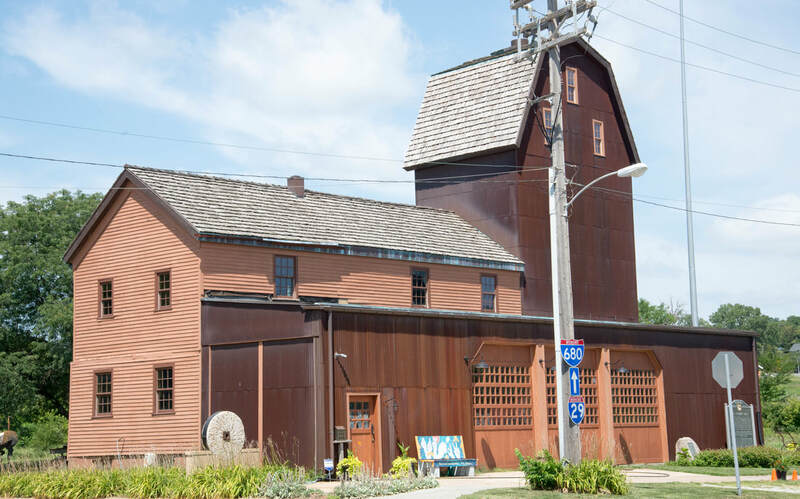 Today the Florence Mill is operated as the Winter Quarters Mill Museum and Art Loft Gallery. The second picture in the top row of the header is of the Gerald R. Ford Birthplace and Gardens (not pictured) and Gerald R. Ford Conservation Center. Gerald R. Ford, our 38th president was born Leslie Lynch King, Jr. in Omaha, NE on July 14, 1913. His parents separated 2 weeks after his birth, and his mother moved with him to live with her parents in Grand Rapids, MI. 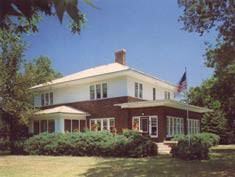 There she married businessman, Gerald R. Ford. From then on, Leslie was called Jerry Ford. Although he was never adopted, his name was legally changed to Gerald R. Ford, Jr. in 1955. After an outstanding college football career, graduation from Yale Law School, serving 25 years in the U.S. House of Representatives, and as Vice-President, he became President in 1974 when Richard Nixon resigned. His 865 day long presidency is the shortest in U.S. history for any president who did not die in office. The Gerald R. Ford Birthplace and Gardens were dedicated in 1977 and mark the location where President Ford lived at his grandparent’s home for several weeks after his birth in 1913. Adjoining the site is the Gerald R. Ford Conservation Center, a regional center of the Nebraska State Historical Society. Founded in 1995, it provides conservation services for historic and artistic works. The Center also contains a small exhibit of Ford memorabilia. Both conservation and exhibits are available by appointment only. The third picture in the top row of the header is of Chihuly Serenity. 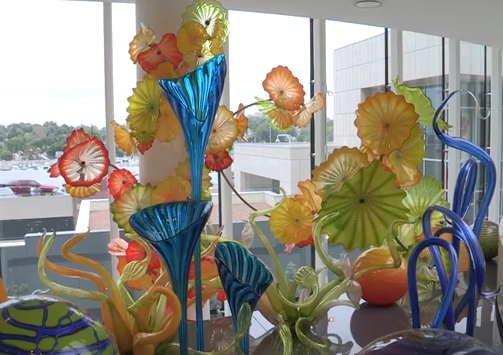 Dale Chihuly is a world-famous blown-glass artist, yet despite having his art in over 200 museums and countless places around the world, there was something he had dreamed of doing but had not. In 2014, Omaha philanthropist Walter Scott approached Mr. Chihuly about creating a space for meditation at the soon-to-be-built Fred and Pamela Buffett Cancer Center at the University of Nebraska Medical Center in Omaha. The conversation revealed that Mr. Chihuly had always dreamed of doing a chapel. Chihuly Serenity is the realization of that dream. 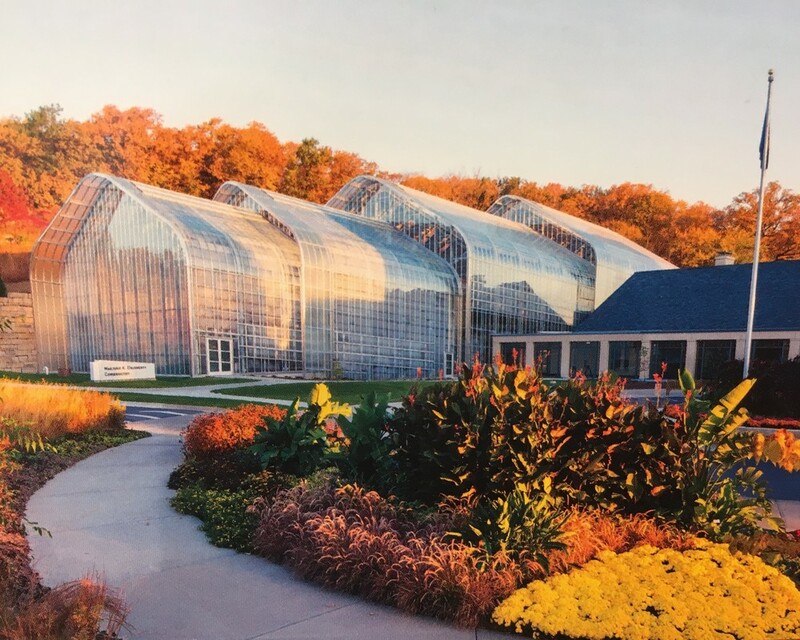 Designed to create a space where patients, caregivers, and researchers can go to find a moment of peace, it is filled with incredibly beautiful blown glass and is the cornerstone of the center's healing arts program. Chihuly pieces are located throughout the center. Chihuly Serenity is on the 4th floor. The first picture in the bottom row of the header is of "The Elms." Located about 50 miles from Omaha in Elmwood, Nebraska, “The Elms” is the prairie mansion-style home built in 1922 by Nebraska Hall of Fame author, Bess Streeter Aldrich and her husband Captain Charles Aldrich. While living there from 1922-1946, Mrs. Aldrich published over 100 short stories, 12 books, and 1 movie, “Cheers for Miss Bishop.” “The Elms” is on the National Registry of Historic Places. ​The third picture in the bottom row of the header is of Spirit of Nebraska Wilderness Park and Pioneer Courage Park. With the Louisiana Purchase in 1803, the United States doubled in size in a single day. One half was developed and populated, the other half not even mapped. To pay tribute to the "age of the Pioneer"--to the thousands of people who endured so many hardships while settling the West, First National Bank of Omaha commissioned the creation of two parks. The 67 sculptures in the two parks are the largest installation of bronze and stainless steel sculptures in the United States. Kent Ullburg of Corpus Christi, TX created the sculptures for the Spirit of Nebraska Wilderness Park at 1601 Dodge Street. 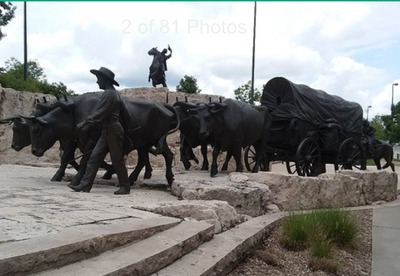 Utah artists Blair Buswell and Edward Fraughton created the large covered wagon train and bison for the Pioneer Courage Park which is located between 14th and 15th streets from Dodge Street to Capitol Street. We encourage you to visit them.